Jabulo Sithole was born with Multiple Sclerosis, but the Big Favour changed his life forever by giving him something that's going to make the world of difference. Take a listen to this week's Big Favour or read the details under the podcast. Heidi wrote in to tell me about a 23-year-old man who she'd met on the Durban Beachfront. Jabulo Sithole was born with Multiple Sclerosis. He attended the Open Air School in Durban. He has his matric, but life hasn’t been easy for him. He can’t stand upright but can walk with great difficulty. His legs are weak and bent, and his only form of help is a broken crutch that he uses every day to get from the shelter he stays in to the Beachfront where he begs for money. Heidi’s heart went out to Jabulo, and she knew that she just had to do something to make life a little easier for him. I contacted Ingrid Burton and her team at SQS Group Limited, and they jumped at the opportunity to help. What Jabulo needed was a set of wheels. There are no words to describe his joy when he found out he'd be receiving a brand new wheelchair. No more strain on Jabulo's legs and he describes the brand new wheelchair as his 'fast and furious wheels'. 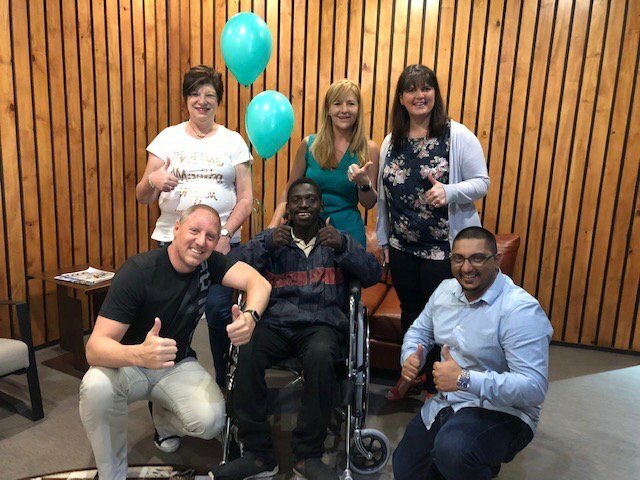 Heidi - thank you for writing into the Big Favour, and thank you SQS for giving Jabulo his dignity and allowing him the opportunity to live an easier and more comfortable life. SQS is a global leader accelerating agility and performance through world-class quality. This position stems from over 30 years of successful consultancy operations. Using global leading capabilities in Business Agility, Management Consulting and Continuous Quality, SQS ensures their clients’ pace of change becomes a competitive advantage. SQS consultants provide solutions that are driven by a standardised methodology, industrialised automation processes and deep domain knowledge. SQS South Africa has offices in Durban and Johannesburg. In February 2018, SQS was acquired by Assystem Technologies, a world-class partner in engineering, quality and digital solutions. The combined organisation has 14,000 employees in more than 25 countries and achieved combined revenues of approximately €1 billion in 2017. You can contact SQS on 0860 388 870 or visit them at 29 Salisbury Avenue, Westville.